Cabernet Sauvignon (pronounced cab-er-nay saw-vin-yawn) may not have the popularity of Shiraz, but it’s the grape behind some of the world’s most noble wines. Here in Australia, it’s grown throughout the country, but is most famously made in South Australia’s Coonawarra region. The classic match for hard cheeses and roast lamb, Cabernet Sauvignon is a grape variety worth getting to know. The birth of Cabernet Sauvignon is thought to have occurred in 17th century France. It came about, it appears, by accident, when Cabernet Franc met Sauvignon Blanc. What a happy accident that turned out to be! It became popular during the 18th century, planted most prolifically in the Bordeaux region of Medoc. While Bordeaux is its home, Cabernet Sauvignon is rarely made as a straight varietal wine there, more often blended with Cabernet Franc and/or Merlot. 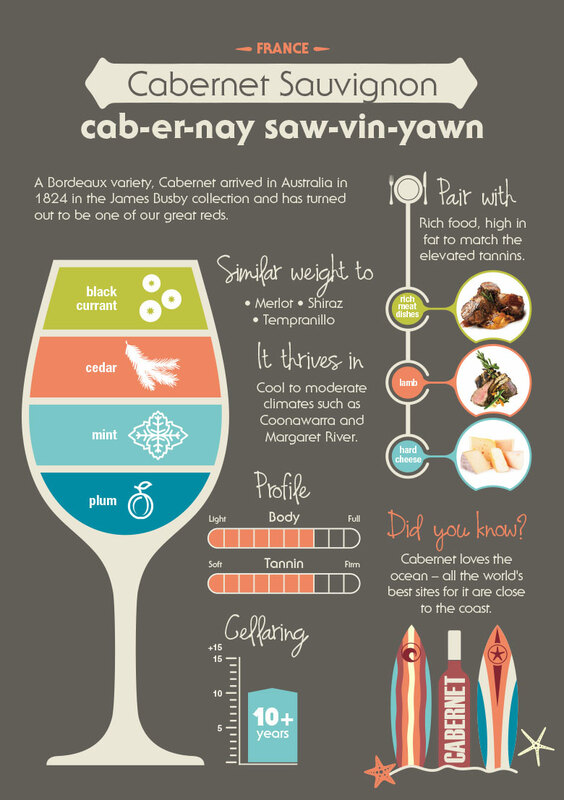 Having been brought to Australia in the James Busby collection, Cabernet Sauvignon has thrived in certain Australian regions. While the most famous Cabernet region in Australia is South Australia’s Coonawarra, wines of rival quality are also made in Western Australia’s Margaret River. Other regions of note include the Barossa Valley, Langhorne Creek and Clare Valley in South Australia, Mount Barker in Western Australia and the Yarra Valley in Victoria. If you’re serving lamb, Cabernet is its favourite wine partner, thanks to the tannins, which cut through the rich, fatty meat. Hard cheeses are another classic pairing and it also matches well with dishes featuring warm, earthy spices such as Moroccan food. Avoid anything with bitterness. The most prominent Cabernet characters are blackcurrant, plum, ceda, and mint. A full-bodied red with fine yet firm tannins, it’s similar in weight to Merlot, Shiraz and Tempranillo. Quality examples will develop beautifully for up to 10 years or more.